Could your Destiny 2 screenshot snare you a Destiny 2 Apple Watch and bag of loot? Happy Destiny 2 day, Guardians! 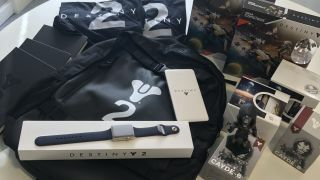 To celebrate, we have a veritable loot chest of Destiny 2 bits to give away that includes a rather slick and very limited edition Destiny 2 Apple Watch. For a chance to win our mega loot box, all you have to do is share your coolest Destiny 2 screenshot with us on Twitter. Whether it's you chilling watching the Tower burn, or recreating that iconic 'King of the World' scene from Titanic on Titan with another Guardian, it's entirely up to you. Just think like Cayde and you'll have no trouble. To enter, all you need to do is upload your Destiny 2 screenshot to Twitter. Please @GamesRadar and add #GRDestiny2 so we can make sure we find you when the competition closes on Wednesday September 13 at 11:59pm BST. Check out the selection of prizes below, then get grabbing.